I speak on a variety of product management & design topics. Product management — how to develop great products, what type of methodology is right for your company, the role of product management, and why it’s an essential role. User experience design — what it is, why it’s important, and how to introduce UX thinking into a company. Software development culture — the changing landscape of employment, how to build successful remote teams, how to work better together. If you’re interested in inviting me to an event, please send me an email. My current and some of my past talks are listed below to give you a flavor for what to expect. My latest talk is about the culture of making good products. Most product management training and advice focuses outward. We are taught to care about the market above all else, and we learn the ins and outs of product discovery, customer journeys, go-to-market strategies, and MVPs. But what would your processes look like if you started by looking inward instead? If you focused on the happiness of your team first, and put everything else after that? That is the question we asked ourselves at Wildbit, and this is the story of what we learned. What does a development process look like that’s built entirely on team trust? What implications does that have for effective execution and the product management role in particular? 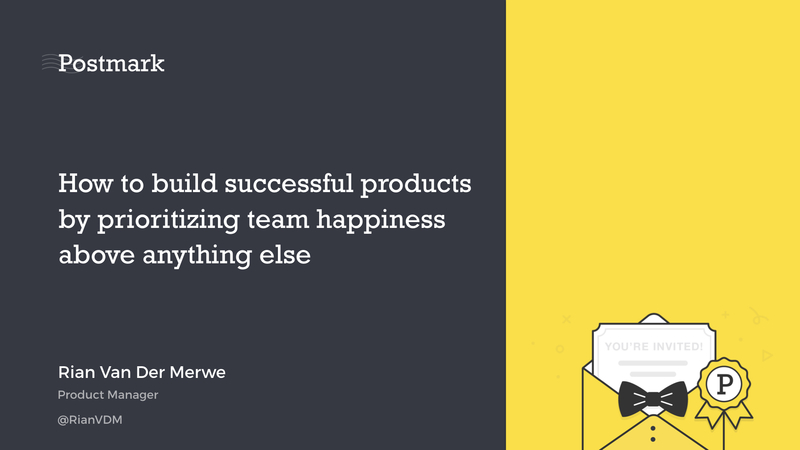 How do you build a culture that makes the team happy and also facilitates building great products that users love? This is, in essence, a story about my own humbling journey through this process. It might all sound a bit weird, but I think we learned some valuable lessons. I recently delivered this talk at Landing Festival in Berlin. Here is an overview of some of the talks I’ve done over the past few years. The most difficult environment in which to innovate is in a large enterprise. Once a company grows over a certain size, the internal politics and number of people involved in every decision increase so much that it becomes virtually impossible to stay focused on fulfilling user needs and business goals. Instead, the focus turns inward to the opinions and whims of individuals inside the company. When an abundance of stakeholders are involved in a product, user research is the only way to focus a whole team on the real needs and goals required for success. But it can be very difficult to get buy-in and conduct research in the enterprise environment—and even harder to get product recommendations on the roadmap. User research is an immensely valuable tool to improve an enterprise product’s user experience and business value. For some reason many enterprises have unfortunately lost sight of this fact, and research got a bad name. This talk will help my fellow frustrated designers and researchers make some headway in their organizations to prove the value of research and restore it to its rightful and important place in the product development lifecycle. Designing for the enterprise is really, really hard. The reason it’s hard is that in most cases the people who buy the software and the people who use the software are completely different, and therefore have completely different needs. The people who buy enterprise software — IT managers, HR managers, etc. — care about things like configurability, control, more features than a competitor, and most of all: the ability to customize the thing just so, so that it fits in with whatever systems already exist. End users care about none of those things. They care about getting a job done as quickly and with as little pain as possible. How to balance the needs of different product audiences effectively. How to bring user-centered design and Lean UX principles to the slow-moving machine that is the enterprise market. Enterprise software has never been this fun. I feel a little bad for the static wireframe. It’s had a bad year. In fact, UX deliverables in general have had a bad couple of years. There’s a growing skepticism about the value of Personas and other traditional UX artifacts, as well as an onslaught of “get out of the deliverables business” refrains from Lean methodologies. All of this led me to lots of introspection about deliverables, and if it’s actually possible to create deliverables that are useful to help create better products. In this talk I’ll tell our story. How we stripped down all our deliverables to almost nothing, and then started building it all up again slowly by asking ourselves, “What is absolutely necessary for us to do a great job?” I’ll discuss some of the deliverables we’ve since created (such as Expanded Journey Maps and Content Slice Diagrams), how they’re useful to us, and how you might be able to use them in your design process as well. We’ve come to realize that not all UX deliverables are bad. Only bad deliverables are bad. As responsive web design (RWD) continues to become the new standard for web development worldwide, there is still a lot of skepticism about its relevance in the African context. Since the mobile phone and data access landscape is so different here, many feel that it’s too early for us to spend time and money on designing websites that adapt to whatever device and viewport size might get thrown at it. In this talk I discuss how the web in general, and mobile context specifically, have changed over the past few years, and how responsive web design is the best approach to adapt to these changes. I’ll then address the major concerns about responsive design in the African context, point out the fallacies, and argue that overcoming the legitimate challenges are absolutely worth our time and effort. This might be Africa, but responsive design is every bit as relevant here as it is anywhere else in the world. How do you develop web sites that users love and that allow them to do exactly what they want to do without fuss or bother? How do you make sure users can navigate your web site effectively and get to all the information they need quickly? The answer lies in the process of User Experience Design, which at its core is about delivering business value by making sure there are no points of friction along the user’s journey through the web site. In this talk I give an overview of the elements of User Experience Design, and more importantly, why you should care about it. The goal is to provide some baseline knowledge of the user-centered design process to equip anyone to take those skills back to their desks and start applying it immediately. We’ll discuss product discovery, user experience research, information architecture, content strategy, interaction design, and visual design, and how those elements work together to build great experiences. Why do we so often see web applications with inferior user experiences? Why do UX designers often get stuck being asked to “make the design pop a little more,” with no room or incentive to innovate? Why do some web developers feel demotivated and unable to break out of doing things the way they’ve always been done? In this talk I explore some of the main causes of ineffective software development, and discuss practical recommendations on how to improve team structures and development processes to build high quality software that users care about, want to use, and that therefore makes more money for the business. I discuss how to work with developers, how to ensure everyone gets input into the roadmap without it becoming chaos, and how to make sure that the business benefits are clearly articulated and communicated. And for something a little different, here’s a video of a talk I did on writing this site. You can also read my extended post about it.